Everything about a Phoenix Organ makes it authentic to its pipe organ counterpart. Our goal is to build for you the best possible musical instrument that will meet your particular needs. We can provide whatever tonal palate you wish, be it Baroque, Romantic, French, English, American or your own eclectic choice. Our designers can assist you in ensuring that the instrument has musical integrity and meets your musical requirements. Staff at Phoenix Organs have extensive experience of designing organs for both liturgical and concert use. The Phoenix Organ System was developed in the UK and has been designed from the �ground up�, with no technical pre-conceptions, and is the most flexible on the market today. We continue to develop the system in UK. Recent developments have enabled us to increase the amount of memory available to store sound samples (up to 2048MBytes in our largest systems) further enhancing the quality and authenticity of the Phoenix Sound. All the Phoenix Organ Systems used in instruments built in the UK and overseas are manufactured in the UK. Old-world craftsmanship and the highest standards of excellence characterise the design and construction of our consoles. The electronic elements of our organs are built to the highest standards and fully tested before shipping: we use standard electronic components to ensure their on-going availability. The sounds emanating from a Phoenix Organ, along with the look and feel of the console, will convince you that you are playing a truly fine pipe organ, one that you will enjoy playing over and over again. We believe that our instruments are the best substitute for the real thing. Explore this site to find out why and order the CD to hear for yourself. We can arrange demonstrations so that you can try out our organs yourself. Contact your nearest agent or contact us directly. To help you appreciate the excellent value our organs offer, we have prepared specifications for a two manual and a three manual organ. Please contact us (without obligation) for the current prices of these instruments - we promise you will be pleasantly surprised. The recent installation section of the web-site provides comprehensive details of some of the instruments we have recently installed. "We commissioned a three manual custom built draw-stop instrument from Phoenix Organs UK made from pine and stained to match the interior at Nazareth Unitarian Chapel Padiham. Over a few months following delivery, the digital sound samples were adjusted and finished on-site so that the organ instrument sound as we wished in the Chapel. We have had a number of concerts organised for the instrument and the general consensus of the audience has been most favourable. I cannot speak too highly of the painstaking attention of David Bostock, not a merely before its production, but during the installation and especially afterwards. Nothing has been too much trouble. I unreservedly commend the company to anyone considering a digital instrument of high quality at a most competitive price!" "The Phoenix organ at Penallt has exceeded all expectations, not just in the realism of its sound but in the variety and authenticity of its colours. 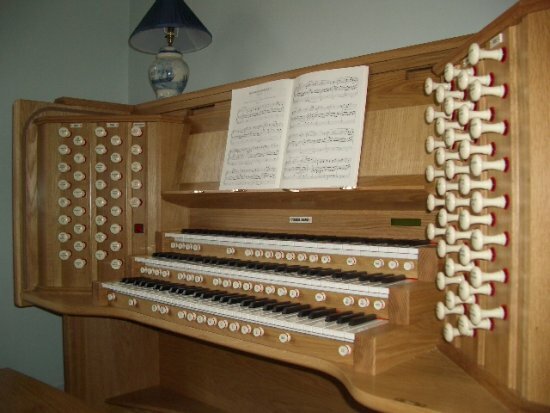 It demonstrates persuasively that given high quality samples, amplification and digital design systems the physical limitations suggested by a traditional pipe organ can be left behind whilst maintaining the aural illusion of a fine pipe instrument." To receive a copy of our CD demonstrating the beautiful sounds of a Phoenix Organ then click on the CD icon. (Please remember to include your full postal address). Over the past twelve months we have continued to be very busy and some of the work we have completed is described below. We rebuilt the electronic instrument in Arnold Methodist Church, Nottingham reusing the existing console; Paul Hale gave the opening recital in November (2007). We built a three manual residence organ in a fine draw stop console for the home of Mr Godfrey Slatter (Cornwall); we also completed a three manual organ for the home of Mr Malcolm Smith. We built a 50 draw stop, three manual organ for All Saints Church Kings Heath, Birmingham; this was dedicated at Pentecost (2008). The Minster School, Southwell took delivery of their new Phoenix Organ early in the year. 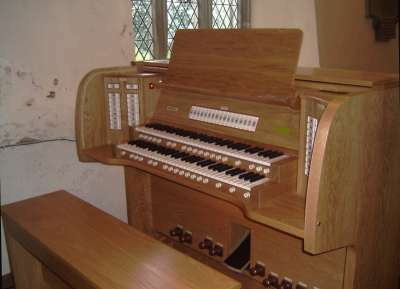 This has a very similar specification to the organ we built for Holy Trinity Southwell. Early in the summer we completed the installation of a new organ in English Martyrs Church in York; here we were able to reuse the existing console. We were again able to make use of the console from the previous electronic organ, providing new electronics and audio system for St John's Methodist Church, Wolverhampton. We were very pleased to build a large four manual organ for the home of Francis Madden (in Scotland); the organ has a distinctive French flavour. We also completed another large three manual residence organ for Peter Smith (Merseyside). We have just delivered a new instrument to St Edward's School (Oxford); the organ has three manuals and 16 independent audio channels. Working with the newly formed Phoenix Organs franchise in Budapest, we have supplied a large Phoenix organ for the Godollo Church in Budapest and a three manual hire organ for the Jaki Chapel (also in Budapest). A large four manual organ with two consoles has been commissioned for another client in Budapest. We have been developing a bell simulation system which is presently being used in Dalton, Skelmersdale, Merseyside. The final version will support clock chimes as well as funeral toll, change ringing and round ringing. Our address has changed - please see the updated contact page. We now have our new telephone number, 01254 703325.